Kurosawa's life and work are well-documented in some excellent books. His own autobiography - Something Like An Autobiography - is essential reading, as are Donald Richie and Stephen Prince's books. 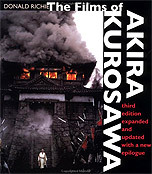 Books to indulge a collector in detail, to books discussing Kurosawa's themes and their effects on the 21st Century. We are indeed grateful for the literary dedication to Kurosawa's work and can recommend our favourites in a little detail below. Essential reading for any Kurosawa devotee. Poigiant and funny, reading Kurosawa's story is inspiring and enjoyable. Richie's book is a bible for Kurosawa-lovers. It has detailed discussions and information about all of Kurosawa's films; loads of rare stills, plus one of the best filmographies on the market. Possibly a bit too high-brow for some, but essential reading for the Kurosawa student. Awesome, detailed book about Kurosawa's work. Particularly good for the technical stuff, Prince is a leader in his field. Japanese short stories that inspired Kurosawa to make the film of the same name.